The Proposal: Having a great (mostly thrift store & vintage) wardrobe has its rewards. Compliments, admiration, walking into work late but looking interestingly fashionable - both cause & effect of standing way to long in front of said wardrobe, happily murmuring, “oh, what to wear? so many choices!” Friends ask to borrow my clothes, to help them style their outfits, to give me $50 to go shopping at a thrift store for an outfit to style for a photo shoot. Ok, most of the above does happen to me routinely, but the $50 was a first. I should have known there was going to be a catch: an accompanying article to be written from a stylist’s viewpoint – with the ultimate mission of educating the public (in a fun way), on alternative ways of ward-robing oneself that lessens the impact on the environment, their bank accounts, gives to charity and individualizes their look. Basically saving the planet all while dressed interestingly and fashionably! The Reality: I am still stuck on the free $50 to spend thrifting for clothes. Have a suspicion that the public has no desire to be educated but I have no problem with the short term goal of instant thrifting-gratification. Call a young cool stylish friend, Melody, to come along to model & join in the fun. $50 is total overkill for one great thrift outfit – an amateur’s mistake made by this E-zine’s editor – one that I felt absolutely no ethical compulsion to correct, suspecting that in our next installment of “thrifting for fashion”, my budget could take a severe hit. The Location: The Summerland Auxiliary Thrift Store, two hours before doors open to the inevitable mob hanging outside, looking at their watches, waiting for the 1:00 opening. 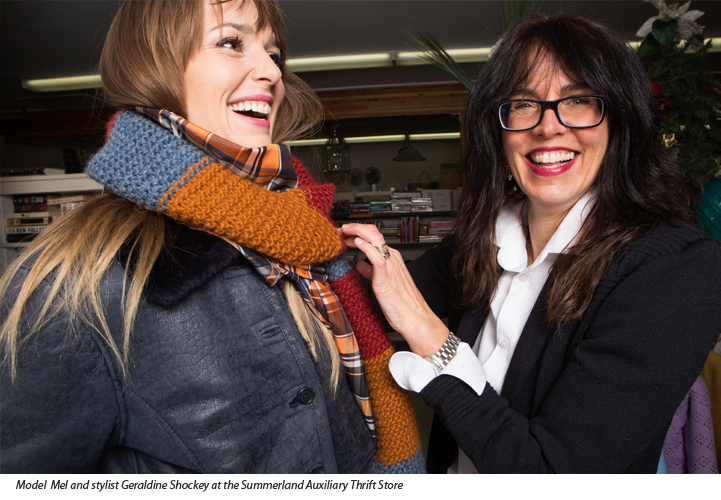 The Summerland Thrift Store has that elusive quality – the promise, not just possibility of treasure, of loot, of a find! 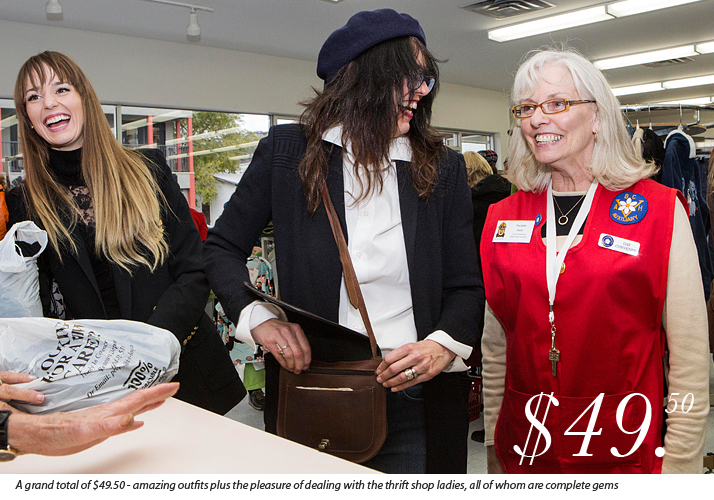 This has earned them a fanatic following of thrifters. And trust me, the red vested volunteers that open the doors at the end of the countdown to 1:00 have mastered the art of leaping out of the way to avoid being trampled. The store is also bright, clean, organized, smells good and rivals a Fortune 500 company in its operation if not scope. An amazing 55 volunteers, some of whom start as early as 5:00 AM to price items, keep the place running. The Auxiliary donated a staggering $400,000+ to local health care facilities in 2012. 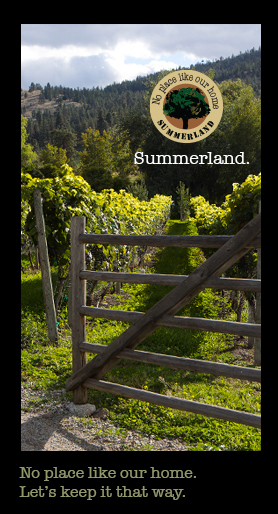 Thank you Summerland Health Care Auxiliary! Official Results of our Shopping Spree: A whopping total of $49.50 spent, thrills & laughs shared, 3 looks easily styled, a photo shoot completed and some fashion treasures to divvy up! 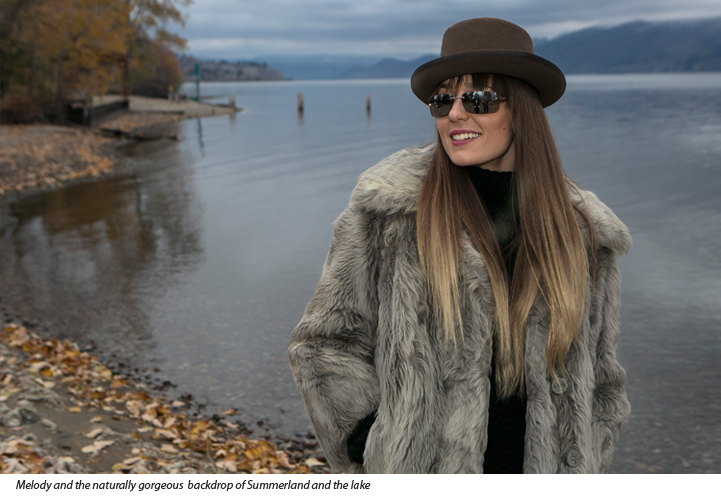 Look #1 – a short coat (car-coat length) vintage faux fur in excellent condition, skinny grey jeans, funky kelly-green soft leather 80′s boots, bulky black sweater, vintage men’s hat also in good condition, and mirrored sunglasses. Total cost: $27. As a stylist, I gravitate to vintage items – they are almost always better quality in terms of fabric, tailoring & detail. Throw it all on Melody, you have a cool girl in cool street clothes. 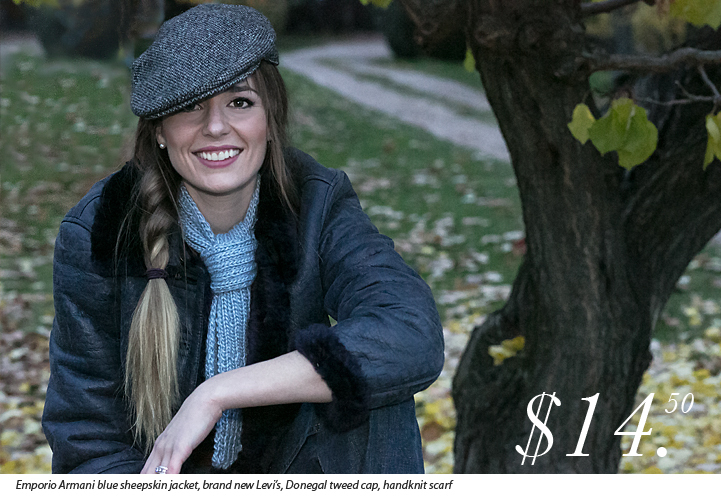 Look #2 – The find of the day – an Emporio Armani (yes, the real, made in Italy, Armani) indigo blue sheepskin jacket, brand new Levi’s, a men’s Donegal tweed cap made in Scotland and a skinny hand-knit scarf. Total cost: $14.50. Melody is wearing a pair of my boots thrifted at another location. For some reason, the good people of Summerland don’t donate enough footwear in Melody’s & my size. Need more size 8s please!! 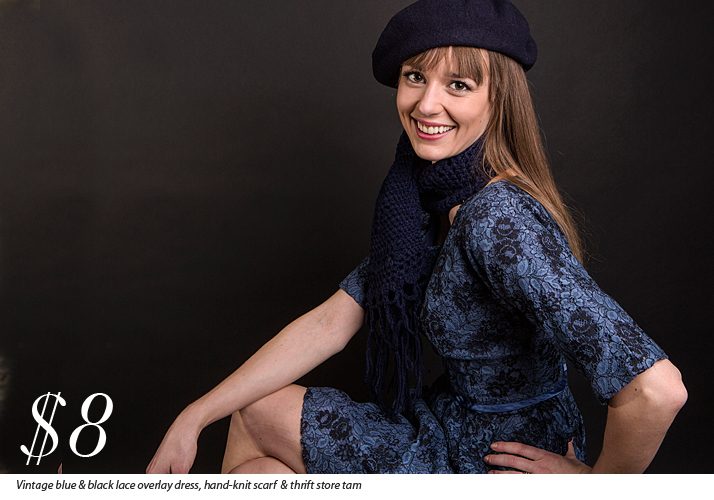 Look #3 – Vintage blue & black lace overlay dress in perfect condition, perfect fit and just beautiful styling. Another hand-knit scarf and the tam I happened to be wearing that day (also a thrift store find) gives the outfit less a Mad Men feel and more a Paris-meets-Summerland look! Total cost: $8. The How To: Sorry, there is not enough space in this article to pass on all the hints, the skills, the shortcuts and secrets to thrifting for interestingly cool fashion. Need another $50… so stay tuned. The Cast: Stephanie, the photographer, editor and paymaster, Melody, the model & cool girl inspiration, Geraldine, the stylist, reluctant writer & owner of way too many clothes! Great job to all the ladies – what an inspiring article, just goes to show that you don’t need lots of money to look fantastic! The whole event looked like it was a lot of fun, the joy is plain to see on everyone’s faces. Thank you Leighanne for your lovely comment. We all really appreciated it. It was great fun with grins from ear to ear! Great article! Geraldine is a great stylist! She kept us looking lovely all week long during the Les Mis run!